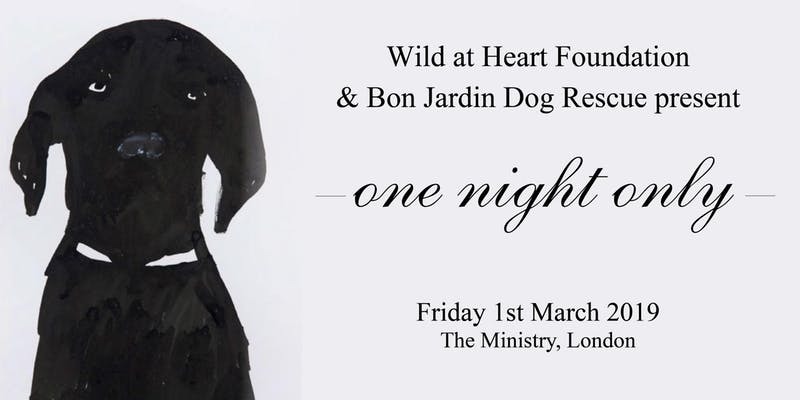 Wild at Heart Foundation in partnership with Bon Jardin Dog Rescue invites you to join them for a very special occasion, for One Night Only 2019 on 1st March! Back by popular demand, we are delighted to announce the return of ‘One Night Only 2019’, Wild at Heart Foundation’s exclusive evening of fine art and fundraising and well-behaved dogs are, of course, welcome. This is a unique opportunity to purchase stunning artworks by celebrated artists at a range of prices, whilst saving the lives of those dogs who need it most. In fact, this year Wild at Heart Foundation aim to help more dogs than ever before, partnering with Thailand-based charity Bon Jardin Dog Rescue. Both charities share a common goal – to compassionately reduce the world’s 600 million stray dog problem through spaying & neutering initiatives, global education programmes, and rehoming. Hosted at the private members club, The Ministry, guests will be able to treat themselves to some of the best cocktails in the city, served at London’s longest copper bar. Artwork will be displayed throughout the night; guests can enjoy an extended evening of drinks, music and socialising at The Ministry, or simply drop in to browse the exhibit at a time that suits. One Night Only 2019 Tickets cost £5, 100% of which is donated directly to the host charities. Event description and image courtesy of the event organisers.